We'd planted about 20 beds of brassicas, including kale, collard greens, bok choi, tat soi, mizuna, and arugula, and cabbage. 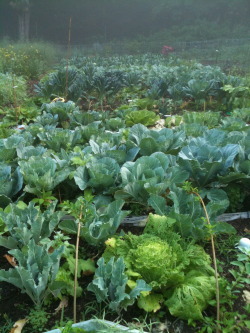 Kohlrabi, cauliflower, chard, broccoli, and broccoli raab rounded out the list. And because of the warm temperatures in May and June, all these plants flourished, growing faster than we could keep up. We began bringing baskets of produce to the food pantry, as the crops came in quicker than we could use them, and before the farmers market had begun. And it got pretty hot as soon as the end of June rolled around. In 90+ degree heat, we grabbled new potatoes on the 4th of July, carefully feeling around underneath the plant to find the treasures buried there. Then, in the midst of a real heat wave over the last two weeks, we harvested quart after quart of dry peas, socking them away for the winter. And just Saturday, we harvested hundreds of bulbs of garlic, now sitting in the barn to finish drying out. We had, earlier in June, cut off the garlic "scapes" (curly shoots of the plant), which contain a seed pod. Doing so ensures that the plant sends its energy into growing the bulb, rather than into reproducing! The scapes are delicious, and we froze and pickled the lot of them, to enjoy their garlicky flavor for months to come. In this season, I feel called to appreciate the potency of the bud, to recognize the flowering within, and to appreciate the "thingness of things," the intrinsic essence of life in whatever form it takes.